16 October 2015, ©. Leeham Co: Airbus announced this week how it made an Ultra Long Haul (ULH) aircraft out of the long haul A350-900. The resulting A350-900ULR (Ultra Long Range) enables Singapore Airlines to reopen the famous direct “Flight 21” to New York. Reading the many comments around how an aircraft like A350-900 can reach such longer range, it can be worth going through the basics on how different parameters affect range and what Airbus or any other OEM has to consider when they want to increase the range of an existing aircraft. We will do that from a slightly different angle than normal. We will show how a pilot would think about how he can get an aircraft with more range. Pilots reason in a different way to design engineers. They are better served by thinking on the aircraft’s range performance as endurance, meaning how many hours can we stay aloft. This works better when one plans with the prevailing weather on the route. We will now take it step-by-step and explain which parameters matters for the pilot and which do not and how he gets his ULH aircraft. An aircraft project team designs an aircraft to fly a nominal payload (a 100% filled cabin with passengers and their bags) to an aircraft’s nominal maximum range. For the A350-900, this is given as 325 passengers in a three class configuration (Business, Premium economy and Economy) to a range of 7,590nm. Pilots that fly a mission which will be close to an aircraft’s maximum capability think differently. They think about how many flying hours the aircraft can produce with the mission’s payload. The reason is that his operational range calculation is always considering the weather and especially the winds. The pilot examines the route at hand and gets the winds along the route from the Meteorological briefing. He then takes the aircraft cruise speed (490kts for A350-900) and deduces the headwinds. Out comes the number of flying hours the flight will take. Now he multiplies the hours with the fuel consumption per hour (~5,800kg/hr for A350-900) and starts to check what reserves he will need and if there is sufficient room for the total fuel he needs for the mission, including taxi-out fuel (taxi-in fuel at destination is taken from reserves, he is safely there). For the reserves, he plans with the regulatory/company route reserves and the fuel he needs for any circling and alternate landing place in case of bad weather at destination. It will be around 7-9 tonnes of fuel dependent on route and weather. Then he adds that to the trip and taxi fuel and tells how much fuel he wants in the aircraft. If the pilot wants to fly a long flight, he needs many hours of fuel. In a normal Singapore Airlines A350-900, he would find they have 14-15 hours of cruise fuel dependent on cabin configuration, load factor (how many percent of the seats are taken) and weather, Figure 1. Figure 1. Weight and fuel situation for Airbus A350-900 operating for Singapore Airlines. Source: Leeham Co. If Singapore wants to fly missions which are 4-5 hours longer, it needs to find an additional 24 tonnes of fuel. The left bar shows that in this case the payload would have to be reduced to seven tonnes. This is the equivalent of 70 passengers, not economical. Singapore therefore asked Airbus what it could do to provide flights with up to 18-19 hours endurance. Airbus saw it could provide an additional 2.1 hours by going to 280t instead of 268t Max Take-Off Weight (MTOW). Airbus knew since the test flights that this margin was available, both from a take-off performance perspective as well as structurally with minor modifications. Singapore Airlines added that it could accept a reduced configuration where especially the payload was reduced to max 170 passengers. This released another 15 tonnes or 2.6 hours. Finally, the 19 hours flights are given as total flight time (block time in pilot language); 0.6 hours of that is time on ground at both ends which consume little fuel. We know now we want an aircraft with 18 hours trip time (pilot-speak for actual flying hours) minimum. The way to get there is higher MTOW (280t), lower payload (16t instead of 31t) and if possible, reduced empty weight (OEW). In the case of a more premium-heavy flight, this is not possible, as the business seats weigh five times more than an economy seat and the premium economy is double a standard economy seat. We have guessed that the premium-heavy SQ A350-900ULR version will be three tonnes heavier than their normal A350-900, carrying close to 100 business passengers and a mix of premium economy and normal economy seats for the remaining 70 seats. All-in-all, it gives the aircraft a typical max fuel load of 117t, more on the days with only 80% load factor (another 3.4 tonnes, which is 0.6 hours in addition). But do we have room for 120.4 + 9 tonnes or more in the fuel tanks? Airbus calculates with fuel weighing 0.78kg per liter, which means we shall be able to fill 165,000l in the tanks. Should we have had the normal tank setup of A350-900 (141,000l), we should only be able to fill 110 tonnes. It would have cut our flight time with over 2 hours; we would be fuel capacity limited and could not fly to US destinations reliably. Thank you once again for all this interesting stuff about flying in a tube with wings! Seeing the pure data, it´s kind of surprising that you still have to lift close to 270 t to deliver a payload of 30 t from point A to B on an average long haul flight. That´s still a lot of fuel going into the atmosphere. It will be interesting too, to see the new cabin configuration with 170 seats or so. Will they reduce the business-class considerably or go to 5 or 6 abreast? The floor space of both airplanes( A340-500/A350-900) is quite similar,so it might be kind of challenging to create a modern top-selling and attractive cabin for the serious and wealthy business-traveller on one side,and generate some positive income for the airline on the other! An airline won’t adjust seat / product specs to the aircraft/ flight. SQ Suites, First, Business, Premium Economy and Economy are defined. They will go for the most profitable mix of their 5 products within the limited cabin space..
Bjorn, Would the reason for the extended trips be to get more revenue, rather than bragging rights? For example lets say Turkish Airlines has passengers wanting to fly to the West coast in the USA. They do not have an existing plane for that mission. If they fly from Istanbul to say land at an East coast airport for a technical stop (take on additional fuel and refreshments) – is this not possible due to some legal restrictions? If they drop the passengers in the east coast and the pax then swop to a local cross country partner – that will mean less revenue than taking the pax the whole way on your own jet. The way I see it – it is just not cost-effective given the four pilots needed along with the reduced pax load. Ultra long distance flights will only make sense if you have full loads in both directions – would you agree? Actually there are flights done by Turkish to LAX and SFO from Istanbul using 777 … it was even really cheap in the last weeks. I looked pretty much “market-share buying” cheap. I had to check because i need to go to SFO in two weeks and and i just decided against this flight, because i didn’t wanted to fly 3 hours in the wrong direction. However I am a bit confused. Taking maximum takeoff mass of 280 mt, subtracting the operating empty mass of 147 mt, we get available payload plus fuel mass of 133 mt. With 170 PAX, the payload mass is roughly 17 mt. So that leaves a maximum fuel mass that can be carried of 116 mt. Using 0.78 kg/liter, that is 149,000 liters! But the tank capacity is 165,000 liters for the ULH version. The 165,000 liter capacity can never be used because then the payload mass can only be 4.3 mt or 43 PAX! Where am I going wrong? Are the OEM values correct? The 170 seats are there but you seldom have 100% loadfactor, normal is 80%. You can also block economy seats if you have very unfavorable winds for e.g. a westerly leg in the winter season, you gain fuel weight and lose little revenue. This means your payload is reduced, fuel load can increase and you need the 165,000l to take care of these extreme cases. With all the talk about range, what about faster speeds to cut down on the many hours spent in a crowded tight seat and tight pitch for many hours. Jetliners travel at about the same speed as they did back in the 60’s. They have made them larger,more fuel efficient,and more dependable but increased speed has not been on the list of improvements for jetliners at all apart from the Concorde. Many if not all of the ultra long flights are over water for a good deal of the time and higher speeds would cut hours off the flight times. I wonder if its the air frame design that is the limiting factor in higher speeds or is it the present day limitations of current jet engines. Maybe some on this forum have insight on why speed is not on the radar for OEM’s. It is a long story. Attempts to build the US version of SST (Supersonic transport) fizzled in the 1970’s. Environmental concerns (ozone layer) of the jet exhaust in the lower stratosphere combined with the sonic boom problem that severely restricted the supersonic phase of the flight was the main reason (along with the high cost of development). IMHO, unless SSTs are allowed to travel over land (which means solving the sonic boom problem), the business case for the SSTs is just not there. Granted trans-Pacific routes are feasible, but then it becomes a niche market and may not justify the very high development costs. Boeing experimented with its Sonic Cruiser concept (M~0.98) that would have provided a slightly higher speed than present (M~0.85), but this comes at a penalty in fuel burn because of the aerodynamics involved. There was no interest from airlines and Boeing quietly dropped it and went with 7J7, which became the 787 Dreamliner. If the fuel prices drop further and stay that way for decades, then perhaps the Sonic Cruiser is worth revisiting but no one can guarantee that. So for the foreseeable future, we are stuck traveling at M 0.85 and 18+ hours on these ultra-long-haul flights. The economics just doesn’t fit. To only highlight one figure (for the lazy ones with not much interest in science or too much technical details easy to find on: https://en.wikipedia.org/wiki/Supersonic_transport#High_costs); the Concord used 16.6 litre/passenger/100km while a B747-400 uses 3.1 … that never pays off – see above Bjorn’s comment why the A340-500 flights were cancelled. And it will be a very long time until the engineers solved that problem for the broader public…. True. Concorde specific fuel burn (SFB) was high compared to subsonic transports of even that era. However, it was a 1960’s design. Today it is possible to build a SST with a SFB of perhaps half that of Concorde and the business case based on that exists for at least a niche market of travelers with time-critical needs. However, development costs of about $20 billion (? ), along with the formidable boom at M 2+ are likely the principal show stoppers. Boeing performed an extensive multi year study in partnership with NASA in the 1990s on developing a new commercial SST (known as the high speed civil transport, HSCT). They concluded that while the technology has improved and certainly lowered the price, you could still not make the business case to develop and build the airplane nor operate it profitably. Keep in mind this is when Jet A was relatively cheap. It would be more expensive now to operate such an airplane. Most long haul / ULH flights involve considerable stretches across the Atlantic, Pacific, Indian Ocean, Arctic, or uninhabited sections of Canada, Russia, or Greenland. And that doesn’t count the overwater flights that occur or can occur on and between the coasts of islands and continents. A Sydney – Brisbane flight, or a Los Angeles – Seattle flight would be almost entirely over water. It’s surely a technical limitation, not a geographical one. Bjorn, Surely there are pavement loading limitations for the already heavily loaded standard A359 four-wheel main gear. You just can’t raise MTOW indefinitely without spreading out the ramp weight, eventually moving to the six-wheel main bogeys. Larger, wider wheels and tires perhaps are enough for this ULR version for SQ… but I wonder if they are pushing the limit and maybe limiting the airports this A359 ULR version can operate at, depending on the airport ramp and pavement specs. The A350-900 have a very widely spread main wheel bogey e.g. compared the the 787-9 and 10 which are close in MTOW. Check the Airport planning guides, it is all there. The loading of the 359ULR is fine for the airports and aprons they will use, otherwise they would not do it. The A320 had an option for a long time for a 4 wheel bogie on each leg but this option hasnt been available for the last 15 years or so. Airport pavements seem to be strong enough, but like airframes its a type of fatigue that gets them in the end. Terribly interesting stuff. Never miss reading a post, and always looking forward to the next one. One recent critical case of capacity & range were the 757 flights across the Atlantic. UA decided recently to withdraw the aircraft because of the unacceptable number of diversions during winter time. 767’s will take over. Looking at ModStore there are several STC’s / providers for auxiliary fuel tanks on the 757-200. Engine thrust / runway performance never was an issue, fuel costs are low. Was overall payload too high to take the extra fuel on those transatlantic 757’s ? I wonder if I am missing something. Take a 787-9, drop its load to 170 passengers and what kind of endurance do you get? Lower cost, less fuel lifted same pax load? at a guess you’d go well below 15t payload. anything beyond 8000nm you are in the fuel volume limited region where payload decrease is in free fall. Drop 100 and you get 22,000 lbs more fuel. Airbus has to do something to broaden appeal since the A359 by itself has basically hit peak orders and it’s essentially a family of one as far as market appeal. ULR versions are almost always niche products to lock in the main family members (778X), though in that case it does look to be the foundation for a later feighter/tanker/USAF option as well. Vietnam, PH, and Thai per link above might be tough sales for this model. SIA of course also committed to the 345 early on, and that became at least as much of an albatross as any other WB order the past 30 years. The centreforaviation.com piece seems to conclude it’s going to be quite a challenge to make this profitable for SIA, even though it’s a comparatively efficient platform vs. the old A345. I don’t see this expanding/securing the A350 franchise’ market share long term, any more than the A345 did. Unlike the A345 or the 778X, the A359ULR can be reconfigured back to the standard range variant. This will appeal to those airlines who want to wade into ULR markets without having to be stuck with a highly niche aircraft that burns too much fuel for anything else, should the ULR market conditions change. Pretty much a very low risk option. Regarding high speed travel on long distances I am afraid there is no hope of that. I worked on Olympus 593 almost 50 years ago and the M 2.05 SFC was 1.12 lb/hr/lb, almost exactly double the best subsonic SFC values today. But SFC without reference to flight speed is meaningless. The cost of developing a supersonic engine would be several times higher than that of a conventional subsonic engine, requiring the development of a very complex variable geometry intake and testing at very high inlet temperatures. This would be a single application engine with a small market. Recent proposals for a supersonic bizjet were based on the JT8D, hardly an engine of the future! The “fuel per thrust and time” metric isn’t all that relevant. __IF__ you can do it with the same thrust. ( wasn’t the Olympus 593 engine the one with the highest pressure ratio ( @ 80:1 for the complete system )?. For the Concorde a quieter, higher thrust , improved efficiency engine was proposed, the Mk622. The existing engine needed reheat for takeoff and the increased range would have allowed trans pacific flights. Low sales killed any development off. The A350-1000 has sold 169 frames since launch in 2007, averaging about 1.6 or so a month. For the past few years it’s done well when selling an average of one frame per month. In an era when it’s common to see 50+ frame WB orders for even 30 year old aircraft, it’s incontrovertable that this model has been a sales disaster, of 748 proportions. Common ? It seems it was a once off deal for a freighter version, that only continues in production because of a military tanker order. I imagine such orders are soft contracts able to be switched to other versions like a 787 freighter when it comes available. Fedex is a prodigous operator of mostly forgotten widebodys, no longer wanted in the passenger world, like MD11, DC10 and A300. If the average age of their DC10s are nearly 40 years, a new off the line 767F would be a boon to replace them. The a330neo is also falling in this category. Launched 11 years after its competitor, the 787 the aircraft has lost most big refleeting contracts. The thrre big remaining contracts for the a330 replacement are turkish airlines,cathay pacific /dragon air together with possibly air transat and delta. Texl1649, looking at e.g 767, A330, 787 and 777 projects, what percentage of A350 do you expect to leave the assembly line as the larger -1000s? Why doesn’t a 777-200LR work on this route? Is fuel load too high given weight of plane vs A350-900LR which uses lighter composites in place of metal? Read the answer to Ted, it is all in the original articles. A hypothetical 280t A358 would had an empty weight of about 11t less than the A359 and two hours more range? 280-130(fuel)-116(oew)=34t? If only 16 of that is pass., then 18t of seats and other stuff? How’s it compare to the most efficient long haul aircraft to date, the 777LR? 346/280, 145/116, the LR is about 25% bigger. 280/116=2.41 346/145=2.39 So the A359 has a slightly better MTOW/oew ratio. The 777LR payload range chart indicates 9300nm. How far can the A359 carry 34t? Whatever % increase that is over 9300 should show the technological advance of CFRP and better engines. you are using numbers that are far from reality, e.g. OEW for a 777-200LR is around 155t normally and would be higher in a premium heavy SQ config. Go to the links to the summer paywall articles in the A350-900URL article and read these through. You get all the data there re individual inefficiencies. Thanks. 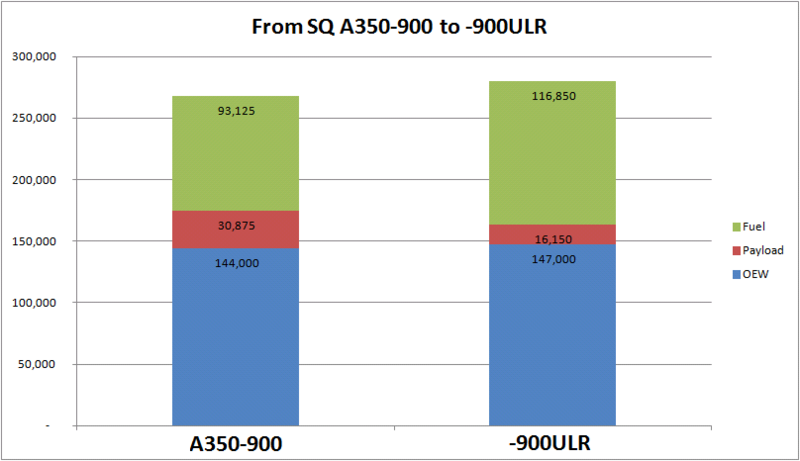 22% less fuel burn for the A350 vs. the 777LR. That makes sense seeing as they have the same wingspan, but the A350 is about a 25% lighter aircraft. Is there any rule of thumb to estimate the operators empty weight vs the manufacturers empty weight, how much per seat? No rule of thumb, but premium economy seat is 50% heavier than economy seat, and lie flat business class seat is 3x as heavy. A question – people are talking about the 787 $27B accounting ditch and how disastrous it is for Boeing. When I read http://bloom.bg/1RcK862 I was surprised to learn those are “Production and inventory costs”. Considering the fact materials and parts has to be ordered well in advanced (2 years) and current production rate of 120/year and sales price of $121M, I would expect “Production and inventory costs” to be (120/year*$121M*2year)/2=~$14B. Add to it investments in machinery and factories and you probably get to under $10B. I understand my math is as inaccurate as it gets but what I try to figure out is – is the ‘high cost’ associated with initial aircraft really going into that airplane or is it tooling ramp up cost that aren’t tied with the actual aircraft. Its really what the cost of production and testing is over a 1500 plane run minus the revenue from those planes. Remember the big orders they got ?, a lot were at unrealistic prices. It must be a sliding scale as the revenue rises as we get further into the production and the additional production costs decrease as the full rate production is achieved. I understand that. But as they doublt production to 120/year you expect a raise of ~$5B at a point of breakeven. My point is, it isn’t 27B they have lost of sold airplanes but more like 10B. Would you agree? My tentative guess is that all extra outlay for the early frames was moved into “inventory”. i.e. the terrible teens should show in the books as inventory value to the tune of ~$500+m per item. less for later frames. afair the prototypes had “book values” beyond $1b. It was never transparently shown that Boeing has actually paid for inventory in the production flow. Hmm, it may look as if further bad news on the 787 will be revealed this week. After losing about $25 million on each jet it delivered in the second quarter, Boeing projects a watershed moment for the plane by year-end: It expects to finally roll out a Dreamliner that brought in more money than it cost to build. That’s when Boeing begins the slow climb out of a deep financial hole that already totals just shy of $32 billion and will increase further when Boeing reports quarterly financial results Wednesday. While Boeing asserts this 787 hole can be filled in just over six years by churning out hundreds of Dreamliners at a profit, even bullish Wall Street analysts have grown nervous over the staggering size of the accumulated losses, already $10 billion higher than Boeing projected just two years ago. Less optimistic observers see no prospect of Boeing ever making an overall profit on this jet. Dominic Gates of the 10-time Pulitzer Prize winning Seattle Times breaks story of one of the world’s biggest business failures – highlighting IISL research. Ted Piepenbrock, an academic affiliated with the University of Oxford and MIT who heads the International Institute for Strategic Leadership (IISL), has taken the math a step further and calculated at what point beyond the 1,300 Dreamliners Boeing might reach that goal. Piepenbrock, who does business-management consulting and research, worked with Boeing’s executive team in the mid-2000s to analyze the 787 program. Since then, it has become his prime case study in how not to run a business. A detailed IISL financial model, updated each quarter with Boeing’s latest results, projects decreasing but continued losses on every Dreamliner through at least the first 700 airplanes, with no prospect of fully recovering the cumulative deferred costs — which the model forecasts peaking beyond $34 billion. Worse, the above IISL, Wall Street and Leeham analyses of 787 costs don’t include Boeing’s original investment to develop the jet, estimated by most analysts at a further $20 billion or more. Piepenbrock’s team, which includes a former strategic analyst at Boeing, concludes the company will never recoup that, either. Ted Piepenbrock’s ultimate bearish analysis of @Boeing’s #787 Dreamliner. Break-even after 5,000 jets are built! In 2003, when Airbus was developing its much-maligned A380 programme while Boeing was launching its celebrated 787 programme, IISL research (using the theory of The Evolution of Business Ecosystems) contradicted analyses from leading business schools, investment banks and management consultancies by predicting over a decade ago that Airbus’ share price would outperform Boeing’s share price over the long term. As can be seen in the graph below, a fund which invested in Airbus would have seen its share price increase 800%, while a fund which invested in Boeing would have seen its share price increase only 400%, approximately two times less. Posted before Scott’s latest comment. circuitous. Not that I think it is wrong. An A350-900 XLH based on the A350-1000 (wing, landing gear) with a MTOW of 308t seems an question of joining existing building blocks & a few auxiliary fuel tanks. Now we know that the A350 wing can take more fuel. Does that mean the A350-1000 can have its range increased in this simple fashion?